No mother should be surprised to see very little of her grown children when they come home for summer college breaks and holidays. We learn this quickly the hard way. Our budding adults want to see friends and to try out their new independence on their old playgrounds. We get it, right? We’re ready. I have been surprised to find it’s more than that. When my two daughters pop home from college for a few days or a few weeks, it is not as satisfying as I envision it to be. In fact, sometimes what I get is the opposite of what I want. I actually miss them MORE when they are here than when they are away. They remind me how much I miss them. When my daughters are off at school, I know I miss them, but I forget just what that means. I forget how their energy brings our quiet house to life. I forget how their voices calling to one another from their bedrooms is the sweetest sound God ever created, even when they’re arguing. I forget the girl-frenzy . . . the frantic rushing to get out the door, running to one another’s rooms for clothes and makeup, looking for misplaced car keys. I forget how they gang up on their father and me, and how their clothes take over the laundry room, even though curiously, no laundry is ever done. When they are home for these brief stints, they remind me what I’ve missed and what I am soon to miss again. They remind me of who they used to be. When my girls are at home, the house they grew up in is a walk down memory lane. It’s another curious sense of loss. When these independent women are living under my roof, I also miss my 3-year-old daughters, and my 10 year-olds and, to my surprise, my teenagers. When they are home, it all washes back over me: every summer vacation, every backyard play, every wretched piano recital. Whoosh. It’s all there again. As I think about them leaving again in a few short days, I don’t see two grown women going in and out of my house, I see a ten-year-old who could never turn the lights out. I see an eight-year-old doing cartwheels at sunset, and a fifteen-year-old trying out for her first high school school play. Oh, how these women in my house make me miss all those little girls. Yes, grown kids home for “vacation” can be rough new territory made of elastic boundries and worthless curfews, but they are also made of ghosts and glitter and fairy dust – illusions that trick us into thinking it’s not really over. They remind me who I was as a mom. I liked the person I was when my children were my whole life. My focus was certain. I was led by my heart. I was patient. I was, at times, truly selfless. Sure, I made more than my share of missteps, but I was a pretty good at parenting, and I miss feeling so surefooted. When they are off at college, my daughters’ absence makes me forget how it felt to be so clear about boundries and so unwavering in my compassion. I forget how kind and patient I can be when I am someone’s first love and last resort. Cue the violins. I know how I sound. So I work to remember I am still that person, and that my children’s little touchdowns are sweet reminders of that very best part of me. Sometimes missing my children while they are still here may seem like backsliding in all the work I’ve done to deal with my empty nest transition. But, somehow, it is all as it should be. Maybe it just takes a few holiday visits to fully accept that this nest was merely their starting place . . . and that the next best parts of their lives, by design, will happen out of my sight. Another version of this article was previously published on this blog in August, 2015. 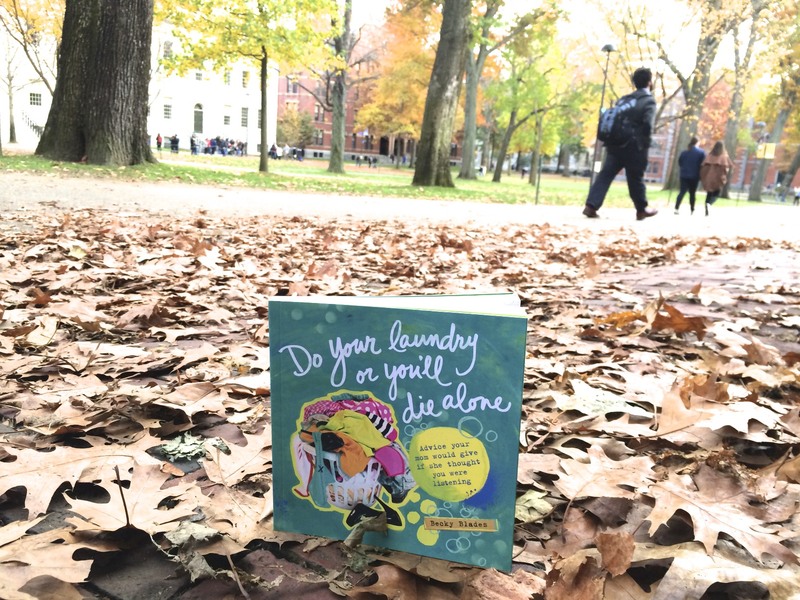 If you have freshly launched young people, check out my book Do Your Laundry or You’ll Die Alone: Advice Your Mom Would Give if She Thought You Were Listening. It helps knowing they’ve heard all the important things. See it HERE.